Is Halo Reach a fitting end to the Bungie legacy? This is it. Ten years after virtually launching the Xbox brand, Bungie's Halo comes to an end. But despite the gravitas of the au revoir - and the fact that Bungie's final Halo game is basically a big tale of planet-scale genocide - Reach doesn't feel like a sombre moment in Xbox history. Reach is a celebration of four fantastic shooters. It pays tribute to entries past (most strongly to the one that started it all, Combat Evolved), whilst delivering the most beautiful and epic campaign yet. In addition, its multiplayer modes brim with depth and customisation never before seen in the series. But is Bungie's last Halo really its best work? We're not so sure. The fifth Halo regales the pathos-filled tale of the human planetary stronghold (that's Reach) - famously wiped out in Halo lore, before the events of the original trilogy of games. Right from 'press start' you can tell this is going to be the most cinematic, visually spectacular Covenant battle you've seen so far. Bungie's become a master of camera angles, swinging and panning across the landscape like Christopher Nolan snapping his sci-fi holiday video. Reach itself is glorious; like Rapture and Liberty City before it, the lush, flourishing landscape is like a character unto itself, painting the screen with more atmosphere and drama than even the lead characters themselves (they're Noble team, the band of smaller-than-Master-Chief-but-still-hard Spartans, who you may have seen parading across every television ad break for the last fortnight). You play as Noble 6, the new anonymous rookie. He hardly ever speaks but still manages to get delegated the toughest and most dangerous jobs on the planet. As a cheaper, more lightweight Spartan III supersoldier, Noble 6 can't take quite the same beating as the larger Spartan II Master Chief - which you discover the very first time you encounter a group of Elites, who swiftly hand your MJOLNIR-armoured arse to you. Halo's enemy AI really is genre-beating - and in Reach you'll see it at its best as your alien foes distract, flank and grenade you into oblivion. The campaign is tight, beautiful and cinematic with an overbearing love for sandbox - perhaps proving that Bungie's learned lessons from the occasionally bloated Halo 3, masterfully scripted ODST and still-loved sprawling worlds of Combat Evolved. Like any great game, Reach never has you doing the same thing for too long. In one scene you battle Elites across a beautiful, Halo 1-esque vista. In the next, you tear a Warthog across an epic battlefield, stealthily assassinate and snipe Elites at midnight and - yes - fly a jet through space. The space combat section is fantastically well done. High above the stunning celestial body of Reach, you'll manoeuvre and spin the Sabre (that's your spaceship) through the heavens, shooting down Covenant vessels via clever HUD items - which show the correct spot to target in order to arch your shot straight up their backsides. But it's not the best airborne section of the campaign. That award goes to the stunningly beautiful mission that sees you piloting a Falcon airship in the rain high above the skyscrapers of a burning Reach city. Like most missions in the game, it's mind-numbingly gorgeous and a real sandbox heaven. Bungie proves once and for all that when it comes to building a place to have a fight, it's the undisputed champ. Impressively, repeated playthroughs reveal the studio's gone even further this time; with this mission a prime example of objectives being completely randomised. Players will start and end in completely different locations to another. Awesome. Reach succeeds, then, in terms of epic scale, drama and deep sandbox combat. It's more beautiful and better paced than any of its predecessors and, at moments, rekindles the spirit we originally fell in love with in Combat Evolved. It's also the most fun Halo ever in co-op. But, sadly, it never truly matches those 'OMGWTF' moments Halo 3 delivered in abundance. (Remember that double Scarab fight?). The campaign - despite its successes in scale, beauty and immense sandbox fun - is structurally the same game the Washington developer's been making for the last ten years. Usually we wouldn't be up in arms over this - it is after all a pretty fantastic formula to sit on for a decade - if it wasn't for the hugely promising, fresh features introduced in ODST. ODST's personal, character-driven feel and sandbox overworld came as a breath of fresh air. These ideas weren't fully developed - ODST was built in just a year, remember - but Bungie had a big chance to take them to their full potential in Reach. Appreciation of that 'feel', of course, is subjective. You might be more of a Halo 3 type than an ODST one - and you can't be begrudged it. But where Bungie should have definitely taken pointers from ODST for Reach is in narrative - an area in which the stop-gap Halo hit an all-time high for the series. Though many fans dismissed last year's game in anticipation of the 2011 big boy, they would've missed a charming, character-filled plot in which we grew a real affection for the members of the ODST team. They felt like real people, we remembered their names... points we sadly can't say about Reach, which in this area feels like a step back. There are vital areas, however, that Reach excels - and even takes a few risks. Most notably, this goes for its outstanding multiplayer mode, which half of the CVG community have no doubt already sampled via this summer's beta. After four games of genre-topping deathmatch, Bungie's wisely decided to shake things up, with character classes, special abilities, experience points (or 'Credits) and character customisation. There's plenty to surprise and excite Halo super fans. At the end of a Halo Reach session you're now rewarded with a fanfare of numbers and medals - as the game tops up your Credit count for acquiring the series' traditional array of awards. These Credits can be spent on customising your metal-suited warrior in a system that's far more in-depth than anything we've seen before in a Halo game. Your Spartan can be tailored right down to individual sections of his helmet, and Reach's emblem editor is both more aseptically pleasing and easy to use. It's a nice touch and another layer of depth on a well established and proven online hit - but it's not the most exciting facet of Reach's Live offering at all. Armour abilities - treated like glamorised Equipment in the solo campaign - add new strategies and brilliant moments to online matches. The first time you ignite your jetpack to avoid an enemy rocket, or assassinate an opponent in midair, you'll know - like we did - that Bungie made the right decision to shake things up. And the sheer amount of depth present in both Reach's playlists (which Bungie will be updating constantly post-release) and the labyrinth of options in Firefight 2.0 is astounding. 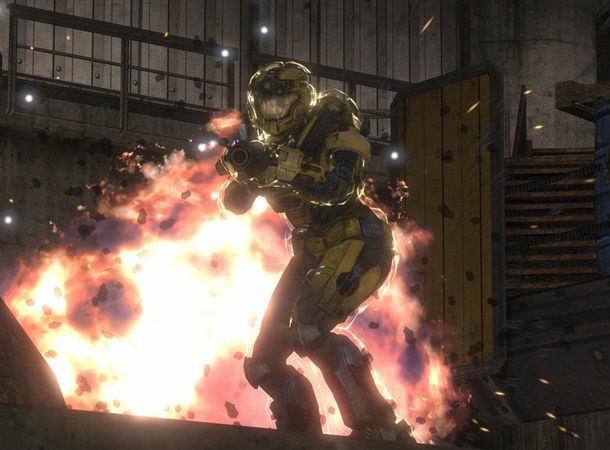 The latter now features our favourite game mode of the series; Versus Firefight, an absolute blast of a game that has two Spartans facing two Elites... and the entire Covenant army. It's fantastic fun and bound to be fan favourite. Purists will be glad to hear that traditional game modes such as Slayer, Capture the Flag and King of the Hill still feature - but we reckon you'll be far more interested in the new stuff Reach brings to the plasma rifle-filled table. Forge, Firefight, 4-player Campaign co-op and a more ambitious multiplayer suite make for one hell of a Halo package. But this isn't a normal Halo - it's a developers' last hurrah to a platform it helped build as a success. And it's for this reason we're left a little bit disappointed Bungie didn't play things slightly less conservatively. But we digress. Don't read into that comment as a serious attack on Bungie's last Halo - because like all fantastic media, critics and fans (of which this writer is certainly one) will critique the smallest of foibles. Whilst not the ambitious Magnum Opus we hoped for, Reach is still very much a classic, refined Halo. So, this is goodbye from Bungie's Xbox reign. It's been a hell of a ride. The studio's opted out of pumping Reach full of the sort of brash, risky ideas that started it all, for a more stable, predictable affair. But that doesn't mean it hasn't put a fitting, beautiful and hugely enjoyable full stop on a series that - in terms of what videos games were capable of - truly changed everything.